Follow this link for gauge pricing and availability. 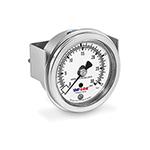 DK-LOK® offers a wide range of All Stainless Steel Industrial and Process Pressure Gauges. 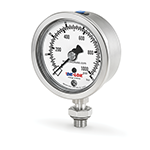 Our DK63/DK100, All Stainless Pressure Gauges are durable (all welded construction) and highly accurate (±1.6% full scale EN 837-1 CL1.6). They are offered in 2-1/2” and 4” dials with pressure ranges from Vacuum to 15,000 psi. 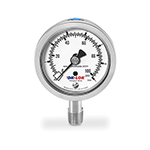 All DK-LOK® gauges come standard dual scale psi/bar and either Dry or Liquid filled. The DK 63/DK100 comes with a variety of connection options including tube stub, MNPT bottom, center back, and lower back mounts. They are also available in SAE bottom and back mounts, panel mount, and front flange mount. Both series come standard with a ventable plug, NEMA 4X & IP65 rating. Our DK45, Process Gauges have a Polypropylene case and are offered with either 316L or Monel wetted parts, Dry or Liquid filled (done at the factory or in the field) and with MNPT bottom mounts. The DK45 has a 4-1/2” dial and is extremely accurate (±0.5% full scale, ASME B40.1 Grade 2A). 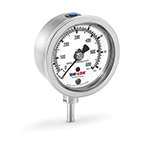 This gauge offers pressure ranges from Vacuum to 20,000 psi. The DK63/DK10 & DK45 are all built around the same engine…our Bourdon Tube pushes the limits of industry excellence. It is this technology, combined with other key features, that will continue to expose the DK-LOK® Value. Please ask our sales team about how you can start ordering product for your most critical applications. 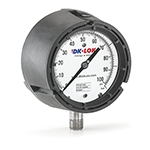 DK-LOK® USA represents a variety of gauges. Please contact us at (251) 472-9580 for assistance in ordering.